Northend under-11s are the comeback kids! Northend United U11s who beat Coleraine Olympic 4-3 recently. In a week where most of the team’s matches have finished for the season, it was the turn of the U11s United team to turn in a good performance against Coleraine Olympic, coming out on top in a seven goal thriller. Lewis Hector scored a brace of goals and Calum McMurray and Jack McIlhatton weighed in with the remaining goals in this end to end match. This weeks game saw the Northend United squad being stretched to its limits, with two players missing from the group, a number of the boys being asked to play in unfamiliar positions and an amazing second half comeback showing the quality of this small group. On the five minutes mark, some brilliant midfield play saw jack McIlhatton chip a nicely weighted pass over two defenders and into the stride of Lewis Hector. The young striker looked sharp and smashed an unstoppable effort into the top corner with the outside of his right foot. 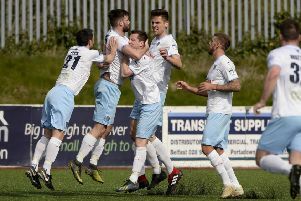 Coleraine stunned Northend with three goals inside the opening 10 minutes of the second half but Jack McIlhatton was fired up and took on four Coleraine players before firing home a cracking right foot shot. With less than ten minutes remaining the wee blues forced a corner; with great movement and pressure on the keeper, Calum McMurray got his reward, forcing a headed effort over the line. With only three minutes remaining the wee blues kept on the pressure. Coleraine went close with a long range effort and as play resumed, the Northend midfield picked up the ball and found Calum McMurray in space. The striker neatly beat his marker, spotted an intelligent run from Lewis Hector and made and inch perfect cross to his team mate. Lewis made no mistake in firmly planting the ball into the net for the winner. The Club is excited to announce that they are organising a seven-a-side 2006 tournament to take place at the Showgrounds 3G on Saturday 18th July. Sixteen teams will compete for the inaugural Slemish Cup Tournament in a competition that Northend intend to hold as part of their annual calendar and expanding into other age groups in future years.